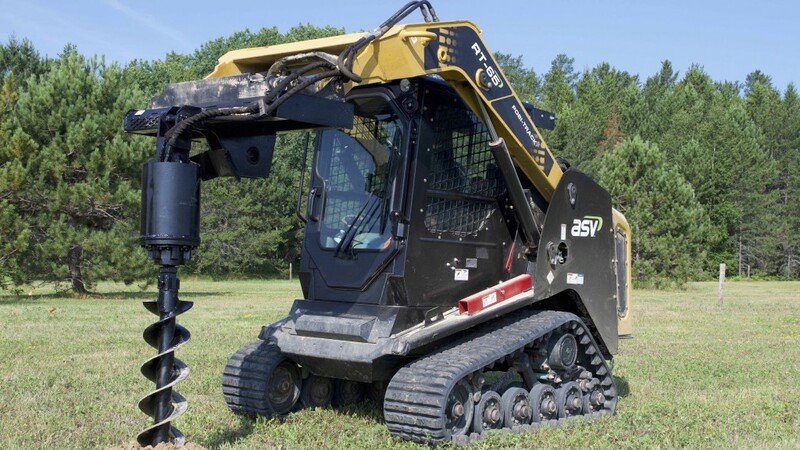 "The RT-65 is everything our customers look for in a compact track loader, including industry-leading serviceability, reliability and power," said Justin Rupar, ASV Holdings Inc. vice president of sales and marketing. "We built the machine with unmatched ease-of-maintenance features that make operators' lives easier. The machine also features a robust design and high performance so contractors can get their jobs done faster and with minimal downtime." ASV says that the RT-65 boasts industry-leading serviceability so operators can spend less time maintaining the machine and more time on the job. These features include a swing-out radiator, top hood and side doors that allow access to all sides of the engine compartment, including filters and other daily checkpoints. The unit's cooler swings out with the door, giving operators total access for easy cleaning and improved machine performance due to the cleaner cooler. To speed the draining process, ASV includes convenient drain plugs on all service items, including drive motors, the hydraulic tank, the radiator and the engine oil pan. The plugs are within easy reach compared to CTLs from other manufacturers that require the operator to remove the tracks to reach them. The RT-65 features easy-to-access spin-on, frame-mounted filters for simple, single-wrench service, rather than hose-clamp-mounted filters. Zerk fittings on the end of all pins make greasing easy. In addition, the machine features a direct-drive pump, eliminating the labor-intensive belt servicing that comes with belt-driven pumps. The RT-65 also includes steel sprocket rollers that are replaceable individually, saving both time and cost compared to other machines that may require replacement of the entire sprocket. The RT-65 offers premium reliability and power. Its turbocharged 67-hp Deutz 2.2-liter diesel engine produces 184 foot-pounds of torque that the drive motors transfer to ASV's patented internal-drive sprockets. Internal rollers reduce friction loss in the undercarriage, resulting in maximum power being transferred to the track regardless of drive speed. The Tier 4 Final engine requires no regeneration, exhaust sensors or diesel exhaust fluid. ASV built the RT-65's auxiliary hydraulic system to be robust, with 3,300 psi of auxiliary pressure and 22.2-gpm standard flow. The company also offers an optional 27.4-gpm high-flow system for even greater performance with more demanding attachments, such as trenchers, milling attachments, landscape rakes and augers. Designed for peak efficiency, the hydraulic system features large line sizes, hydraulic coolers and direct-drive pumps, transferring more flow and pressure directly to the attachment. The direct-drive pumps optimize performance over belt-driven pump systems, allowing the machine to run attachments more efficiently than even higher-horsepower competitive units. As a result of belt-driven pumps and hydraulic system restrictions, ASV says that many competitive machines lose as much as 30 percent of their horsepower. The RT-65 features a rated operating capacity of 1,925 pounds and a tipping load of 5,500 pounds. It is 66 inches wide and has a 116.5-inch lift height. Standard joystick controls make operation easy and intuitive, while a self-levelling system allows attachments to stay at a set position while lifting. Operators can use the unit with all standard attachments. ASV manufactures its loaders with its patented Posi-Track undercarriage. The Posi-Track system allows customers to use the RT-65 as an all-season, all-weather machine with maximum control, flotation, traction and pushing power in steep, wet, muddy and slippery conditions. The system features a flexible rubber track with internal positive drive sprockets to provide superior traction and track life. The open-rail and drive-sprocket design, rather than the enclosed tub system seen on many competitive undercarriages, results in increased sprocket and bogie life along with easier and faster undercarriage cleaning. All of the wheels are exposed in the undercarriage, allowing material to spill out, reducing the risk of abrasive material getting trapped and wearing away at components. In addition, ASV loaders' tracks feature as many as four times more ground contact points than competitive steel-embedded tracks, according to the company. This spreads the unit's weight evenly for lower ground pressure, extra flotation on delicate surfaces, and less risk of turf damage. The result for the RT-65, which contains 12 contact points per track and 15-inch-wide tracks, is a ground pressure of 4.3 psi. The RT-65's many contact points and guide lugs also virtually eliminate the risk of track derailment. ASV designs its Posi-Track and skid-steer loader frames separately to provide customers with the highest performance from each machine. This is different from other manufacturers that use a single chassis for both compact track loaders and skid steers. The dedicated frame for the RT-65 results in a 12.9-inch ground clearance. This allows the unit to easily travel over logs, stumps, rocks and other obstructions with less risk of getting hung up. The purpose-built chassis also provides a 37-degree departure angle, decreasing the risk of the machine getting stuck when starting to climb a steep hill. The Posi-Track system also contributes to operator comfort. The RT-65 features a suspension system made up of two independent torsion axles per undercarriage, allowing for a smooth ride over every type of terrain and speeds as fast as 11 mph. ASV customers can choose from several options to further improve the RT-65's comfort and performance. Optional 16.5-inch-wide extreme terrain tracks lower the machine's ground pressure to 3.9 psi while a smooth turf track allows minimal risk of damage during operation on highly manicured surfaces. Ride control is available to dampen the load in the bucket, limiting material loss and improving operator comfort. An optional bucket positioning system keeps the bucket level while lifting, reducing spillage. In addition, a suspended air ride seat contributes to additional comfort and a rearview camera and monitor boosts safety and visibility.